At this point, a normal girl would have concluded the man was delusional. But I wasn't normal. "The children of Atlantis?" I asked. Ian touched my arm so I would look at him. "I brought you into it," he said. "I'll do everything I can to get you out of it alive." "Good." I replied. I checked out the store to make sure no one else was around. Unsure of how to breach the divide between employer-employee and fellow alien species, I tried to think of something significant to say. All I could come up with was, "So, you're a reader." Upon seeing this book I just knew it had to be a part of Mermaids and Myth month. What I didn't realize was that there would not be any mermaids. I wasn't let down by this but more surprised, even though retrospectively I shouldn't have been. Atlantis is often linked to mermaids upon first thought, but when given pause there are many different beliefs with Atlantis. It's unique in the sense that it carries different myths with it. This includes but is not limited to the fact that some believe Atlantis itself is a myth. What I can tell you about the development and the characters is that it's well done. Craw crafted this myth into something unique and interesting, there's so many elements at play that there's never really a dull moment. What really played well with me was the fact that everything seemed to roll together so well. There was no real elements that came out of left field, making you have to search your brain trying to figure out when you had missed that moment. Yes there were things that could have used a little bulking, and been a little more played out but overall I felt no disappointment in the way things developed and played out. What I liked most about Allison was that she knew she was different from a young age. She may have never questioned it, but as well all know being different can be dangerous. She heeded a warning from a complete stranger (maybe a little unrealistic but if you love your family possible), and tried to disappear. Her love for the family that adopted her is beautiful and she means it when she say that she will do anything to protect them. This is the type of character that believes but only because she has lived it. It's not like she was told what she would become and jumped right into it, she had been hiding from it and was happy to have finally had things explained to her. Some may play this into she will believe anything but for me it was a strength that she was able to recognize the truth in words, and the explanation of why she was exceptional. The secondary characters were well done as well. Ian was a good love interest and though I enjoyed him with Allison, I never did find myself drawn to him. He's a character that I feel people will either find really attractive or just find him as a good supporting one. For me he was a good fit for the book but not someone that I would swoon over. However, he is memorable for his almost creepy start in the book. Though it sounds bad there is a very logical explanation. Craw dove into each characters background enough to give each one some depth, giving the book itself a more well rounded story that was easy to follow the details. Atlantis Rising was a fun read that was not what I had expected. This book is proof that sometimes you don't get what you expect, but can still get an awesome experience. I really look forward to getting my hands on the next book because with the way this one ended (though not a complete cliff hanger), I found myself wanting more. If you are looking for something different and enjoy well developed characters with a solid plot I would recommend that you pick this one up (even if there isn't any mermaids). 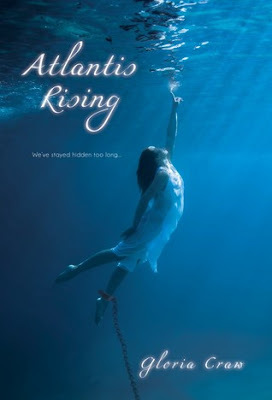 Thanks to Raincoast Books I have a HB of Atlantis Rising to give away! !